My daughter now back at school, phew! So I now have time and the headspace to catch up on blog posts and work. These are one of my favourite muffin recipes, and Yotam Ottolenghi kindly gave permission to share an adapted version of his recipe from the Ottolenghi cookbook here. And why invent the wheel when its been designed so well by someone else? I have been making recipes from this book for a few years, including the wonderful salads and my favourite carrot and walnut cake recipe – which uses sunflower oil instead of butter. We tend to make these muffins when we have friends or family coming to visit and also for playdates – children love them and they do have some (not a huge amount but some) fruit in them, so are a slightly healthier pudding, great for picnics and lunch boxes too. 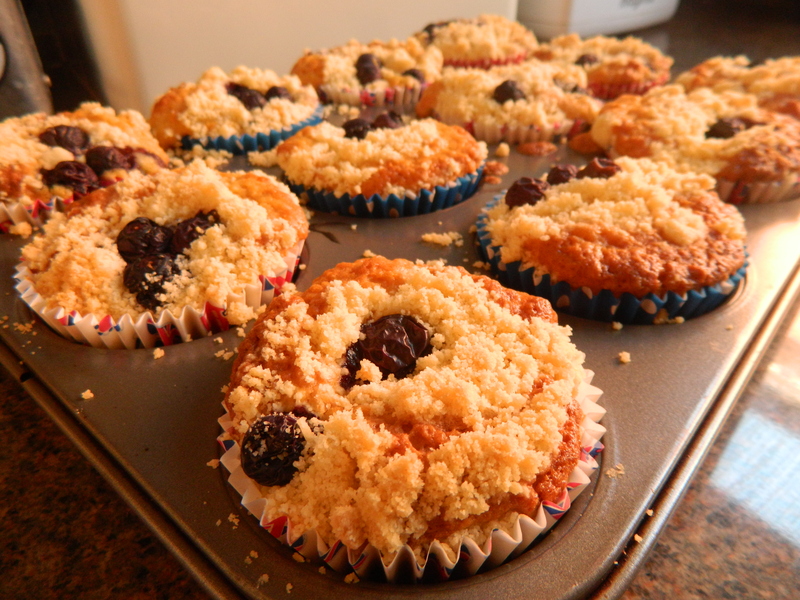 I made these muffins with the blueberries we picked from Trehane Nursery near Wimborne – which was a very calming holiday activity. The picking season is extending hopefully to the end of September this year so we will probably make a visit after school one day. English Discovery apples have been available for a few weeks now. If you buy English Blueberries now freeze them and you can have these muffins well into the apple season without buying blueberries that have been flown in from other countries. It’s possible to make them with gluten free wheat flour and gluten free flour which both work well. I’ve also recently made them with spelt flour which was a little heavier – though the muffins were still as popular as ever. I make this up and keep some frozen*. For this recipe you need about a dessert spoon of mixture per muffin. 200g cold unsalted butter cut into cubes. First, make the crumble mixture by putting all the ingredients into a bowl and rubbing them through your fingers to make the crumble mixture. Give the bowl a little shake and the bigger lumps will come to the top, rub these through so that you have a consistent crumble mixture. The crumble mixture keeps in the fridge for up to 5 days but you might as well freeze what you don’t use as it takes very little time to defrost and will keep in the freezer for months. Pre-heat your oven to 170˚C / gas mark 3 / 325˚F. Line your muffin tray with cases. Sift the flour and baking powder and put to one side. Whisk lightly the egg, add the sugar and melted butter (making sure its not too hot) and keep whisking lightly. Whisk in the lemon zest and milk to the wet mixture. Add the blueberries and grated apple to the liquid mixture. Add the liquid mixture to the dry mixture and stir in, not too much – just enough to combine – allowing there to be lumps. You can check whether the muffins are cooked through with a skewer – if it comes out wet then they need a few minutes longer, if it comes out with no mixture on it then they are ready. So I have slightly adjusted this recipe to suit younger children – by reducing the sugar content and reducing the portion size. So each cake has a teaspoon of added sugar, the rest of the sugar content (about 5g) is from the fruit. Fat and saturated fat content are low in these cakes too). Each cake provides about 170 calories which is just over 10% of the recommended calorie intake for a child aged between 4-6 years of age. Each muffin contains about 10% recommended calcium intake, just under 10% recommended iron intake and about 20% recommended Vitamin A intake for a child in this age group. *Having frozen crumble mixture in the freezer is a great fall back for midweek or Sunday lunch fruit crumbles as it takes very little time to defrost.